In an open market destroyed no more than thirty minutes ago by Russian Federation soldiers with tanks and heavy artillery, a woman recounts how she and the other market women formed a human shield to halt the execution of a group of Chechen boys. Speaking to the camera, in an oddly well-rehearsed role of who stands where and who says what to the camera, the woman is still shaking from the experience. The scene ends with Martens staring shamefaced at the ground, unable to gather enough gumption to ask her what she thinks of him. Ultimately Martens ‘act’ of showing up with his camera and popping the question brings humanity to every situation that he creates. 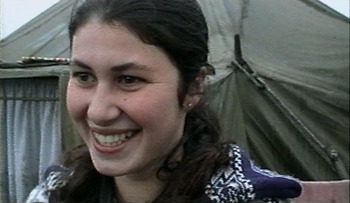 When he meets a young woman in a refugee camp (who bears an uncanny resemblance to his true love back in Belgium), his question changes, ‘How should a man let a woman know that he loves her?’ the woman’s answer, delivered with beaming smile and sparkling eyes, dissolves the miserable tent landscape and suddenly it’s just two people (and their translators) talking about love and life. Of course Martens created this film for an art context, and the film articulately addresses contemporary art issues. Quite possibly Martens would be appalled that I consider his film to be ‘useful’, not just for artists and an art public, but as a tool to talk about the causes of war, hunger and the politics of emergency food distribution. And the question that Martens dares to ask amidst flying bullets, UN press conferences, annoyed Russian soldiers, women in food queues and refugees living in tent camps, the initial struggle that it initiates in the interviewee and in me, the audience, as I am simultaneously embarrassed by this question, but know that it is a question that can air-lift all of us actors out of the immediate and into a larger, more important discussion. Complexity is not complicated. Episode 1 brings us to the next tier, where a complex situation can be discussed with the nuance it deserves.